A Printed Dress that will be a much loved statement piece in your wardrobe. Celebrate femininity, style and confidence in the Cross Front Dress. This design is a customer favourite because it is easy and comfortable to wear. The flattering and feminine cut will make you feel amazing. 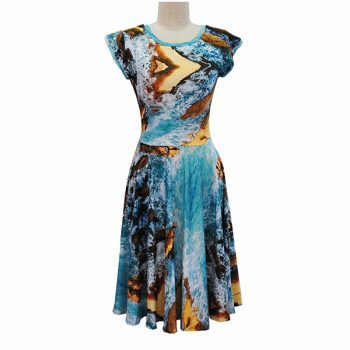 Available in our beautiful exclusive prints, you will turn heads wherever you go wearing this dress. The Cross Front Dress is also a great option for breastfeeding mothers. Many Zilpah Tart customers choose this style to wear while breastfeeding because it is practical but lets them feel fabulous in a beautiful, comfortable dress. Fabric: polyester jersey. Easy care, great for travel and no ironing! Check our size chart for your best size. All of the exclusive fabric prints are designed by the Designer, Yumi Morrissey. She takes photographs of the places and things that inspire her design and turns them into beautiful, fun, digital patterns. These prints tell stories and create connections to the women who wear them. For more information about the prints click here. The Golden Rocks Print was created using an aerial photograph taken near Broulee on the South Coast. The Rocky Shores Print was created using an aerial photograph taken near Broulee on the South Coast. The Sea Green Print was created using an aerial photograph taken at Forresters Beach on the Central Coast.